Tack-tie thin joint wall ties and movement ties. 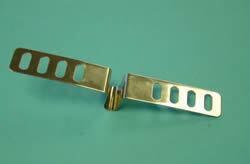 Made from stainless steel these wall and movement ties have been designed for use with the Thin Joint System. 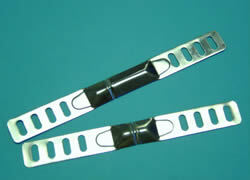 Thin Joint Wall ties are available for cavities up to 200mm. Tackburn can also supply a full range of wall ties and steelwork for traditional build applications. Please call for a quote. For connecting perimeter walls to dividing walls. 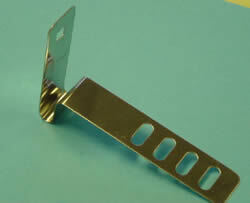 Can also be used for fixing back to steelwork and as a starter wall tie. Requires a fixing. 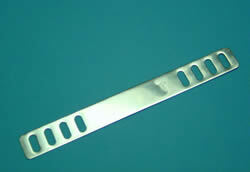 Manufactured in 0.6 and 1.5 mm thick material and various lengths. For connecting perimeter walls to dividing walls providing course levels are the same height. Can be manufactured in lengths to suit application. For use when two skins of thin joint blockwork are being built at the same time and the course heights are the same. This product range now covers cavity widths from 50mm up to 200mm. Movement Tie for fixing back to steelwork, existing masonry, wind posts etc. The tie is mortared into the joint, (no need for a slip joint) and fixed back to the steelwork etc. The excess material in the loop allows for expansion and contraction. Suitable for 75mm and 100mm cavities. 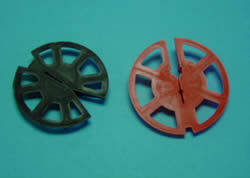 Insulation Retaining Discs Can be supplied to fit all of the wall ties.